Students in Cazenovia College’s fashion design and fashion merchandising programs present the 46th annual student-run fashion show on Friday, April 26, at the Landmark Theatre in Syracuse. 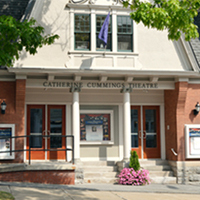 The lecture series features noted faculty members from Cazenovia College whose topics cover the breadth and depth of the liberal arts. Join us for a performance of Cabaret! David Lowenstein directs and choreographs this production with a cast drawn from the local community as well as students and faculty. The Center for Adult and Continuing Education offers online credit courses to all full-time, part-time, and visiting students. A convenient and flexible way of earning credits without having to be on campus, online courses are offered during the College's four terms – fall, winter, spring, and summer. Take courses as a visiting student or enroll part-time to earn an Associate Degree, Bachelor's Degree or a Management Certificate through Cazenovia College's Center for Adult and Continuing Education. We make it possible for you to earn a degree or take courses on your timeline, in the format that fits your schedule, and at tuition rates that work within your budget.